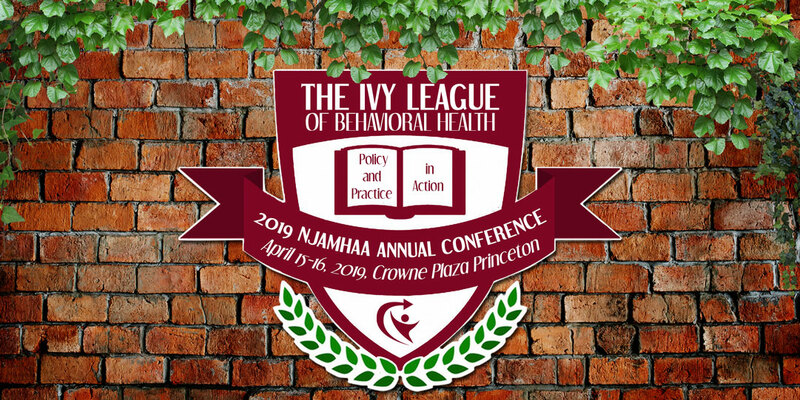 Annual Conference 2019 "The Ivy League of Behavioral Health"
The New Jersey Association of Mental Health and Addiction Agencies, Inc. (NJAMHAA) is comprised of the leading non-profit behavioral mental healthcare, substance use and developmental disability service providers that serve more than 500,000 New Jersey adults and children every year. NJAMHAA’s 160+ members represent organizations and individuals in every county and employ almost all of the state’s behavioral health workforce, including counselors, case managers, social workers, psychiatrists, psychologists, psychiatric screeners, emergency service workers and nurses. This is THE PREMIER event in New Jersey for the Behavioral Healthcare Sector. NJ Social Workers: An application has been submitted for consideration for CE approval. In order to receive continuing education credits, attendees must sign in and out at the conference registration table. Attendees must also sign in and out of each session attended and submit his/her completed evaluation. Failure to do so will result in non-issuance of certificate. Certificates will be mailed to attendees to the address provided in their registration within thirty days. For additional information about CE credits, please contact Julie Moy at jmoy@njamhaa.org. TIME IS RUNNING OUT TO REGISTER!! LIMITED SESSIONS AVAILABLE! Click on the "Register" button above or Click here to Register! Monday, April 15, 2019 - 4:30 p.m. to 6:30 p.m.
the member rate to NJAMHAA events.